RNC chairman Michael Steele is the unwitting star of a new YouTube video. 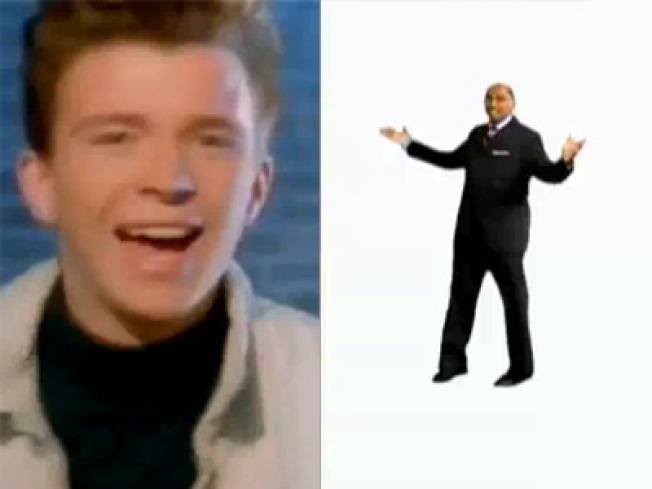 Courtesy of an anonymous internet jokester and Steele's expressive "welcome" video on the GOP's goofy, problem-plagued new Web site, the world gets to watch 51 glorious seconds of Steele "dancing" to Rick Astley's "Never Gonna Give You Up." Unfortunately, the former Maryland lieutenant governor's dance moves leave a bit to be desired. Perhaps he can take some tips from Tom Delay? In addition to Steele's easily parodied welcome video, the new GOP.com is home to such gems as historical analysis from a guy who compared Democratic policies to the slave system and discussion topics like "Kick McCain out of the party." Given GOP.com's attempt to harness the social media tools that helped Barack Obama win the presidency, it seems fitting that it has been subjected to a prank that officially jumped the shark in November 2008. Democrats, of course, aren't immune to doing embarrassing things on the internet. In the interest of equal time, here's Nancy Pelosi inexplicably Rickrolling herself earlier this year (fast forward to 0:38).